Insight to inform business decisions. The terms ‘Business Analytics’ and ‘Business Intelligence’ tend to be used interchangeably but, whatever the term, it is about gaining insights that inform business decisions and can be used to automate and optimise business processes. Data-driven enterprises treat their data as a corporate asset and leverage it for competitive advantage. Business analytics depends on data quality, skilled analysts who understand the technologies and the business, and an organisational commitment to data-driven decision making. Although by no means universal, there are four steps for Business Analytics. 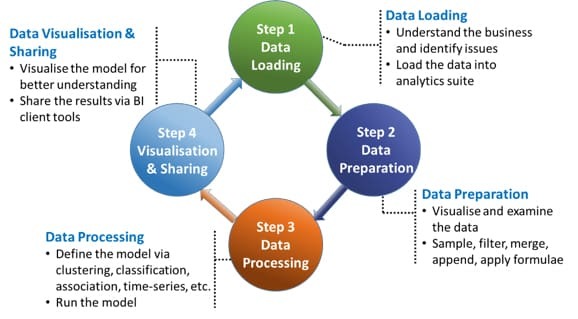 At CSM we recognise that Stages 1 and 2 can consume a disproportionate amount of project time due to having to combine – or blend – data from multiple sources, with missing components, data-entry errors and the myriad of problems that get in the way of efficient data analytics. These problems become exacerbated when combining internal and external data which, all-too-often, are not linked or referenced in a compatible manner. 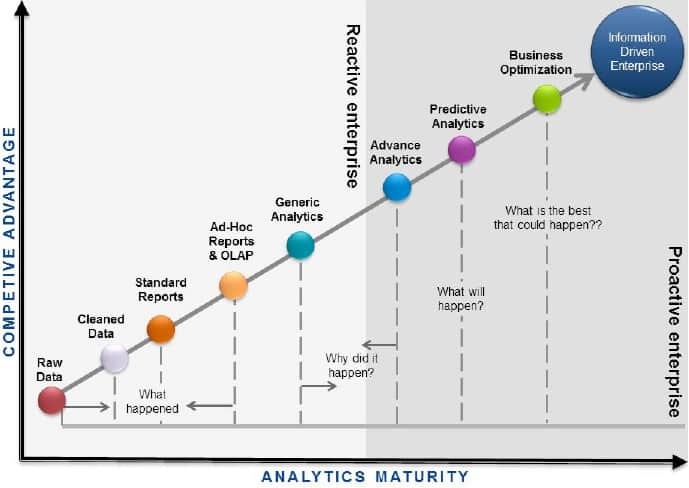 Broadly speaking, Business Analytics – or Business Intelligence/BI – is concerned with what has happened (past tense) and, sometimes, with what is happening (present tense); it embraces the light-grey area on the maturity profile above. Predictive analytics are all about looking into the future. This is the link to generating value for the future in an informed manner as opposed to (the all-too-normal) gut-feel.